Here's a classic but a goodie for fall: These wheat sheafs or sheaves or bundles or whatever you want to call them are so plentiful and inexpensive ... or free, perhaps, if you live in Kansas? I created the above design quite a few years ago using a store-bought bundle. I cinched the center with a rubber band, fastened a shimmery but shear gold ribbon over the band and shaped it into a pretty bow. I tied a thin gold cord around the same spot then hung a silver and gold cross pendant from it. 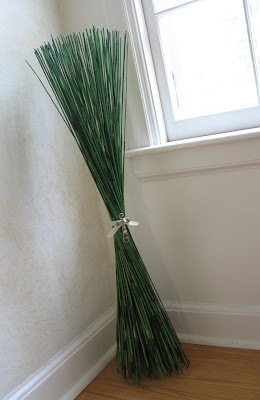 AND, this whole ribbon + cross idea can be done for any time of year because it will work with any kind of "bundled" natural thing: other grains, decorative branches, and reeds: This bundle is just green reeds tucked into a corner of a stairwell landing. They stand about 3 feet high. No matter what your material is, just fasten your attachments a little above center to make it stable and able to stand on it's own. 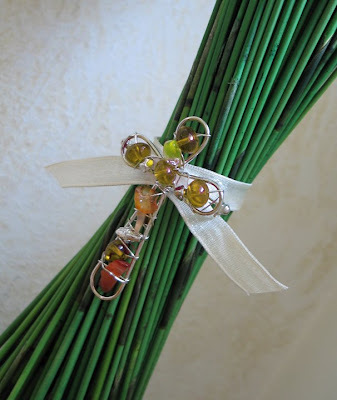 Fan the stems out by giving them a little twist, then tap down to make the bottom flat. 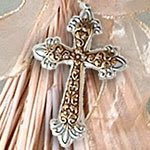 The beaded cross shown above is a pin and it came for Hobby Lobby for $3. Beautiful! And your comment on my blog was so timely to lead me here. Just a few days ago I was lamenting the sorry state of the shelves in our foyer and wanting to redecorate them. Beautiful ideas here. Okay, that is beautiful, and so creative. 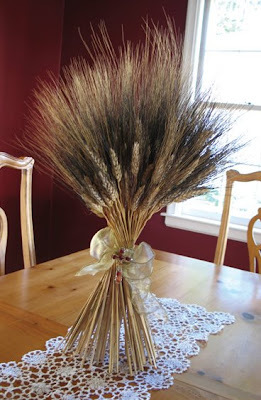 I have always wanted to make a wheat centerpiece...one of these years!!! that is so pretty! I actually can think of a place for that tall grass to go in my house, and I have some cat tails in my backyard, so that might happen after I'm done putting up walls this week!!! Thank you for the sweet comment on my blog! I'm so loving yours... I can't wait to try a few of the ideas you've shared. 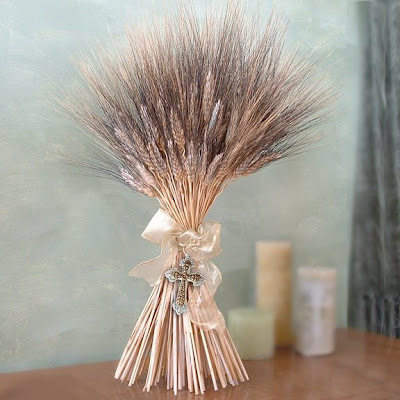 I had to find the wheat to make this at www.curiouscountrycreations.com Just thought others might like to know if they don't have a hobby lobby.